Tenson To make a successful hand,knitted garment to the chosen Size, it is essential that you work to the stated tension – the Correct number of stitches and rows over a IOcm 14inl square. To check that your own tension is the same as that of the pattern, you need to make a small sample square approximately 12cm 15inl in size BEFORE you start to knit a pattern, You then smooth out the sample square, taking care not to stl’etch the fabric, and count the stitches and rows to 10cm 14inl If there are fewer rows and stitches to 10cm 14inl than those specified in your pattern, your own tension is too loose, and you therefore need to use a Size smaller needle. If you have too many stitches and rows, your tension is too tight, and a size larger needle will be needed, Knitting needles come in a range of sizes. from very fine to really fat, A range of materials are used for them, including steel, plastic and, most recently, bamboo. It is important to choose needles that feel comfortable in your hands, and that allow the stilches to slide along easily.The type of yarn and style of pattern will determine the needle size you use. 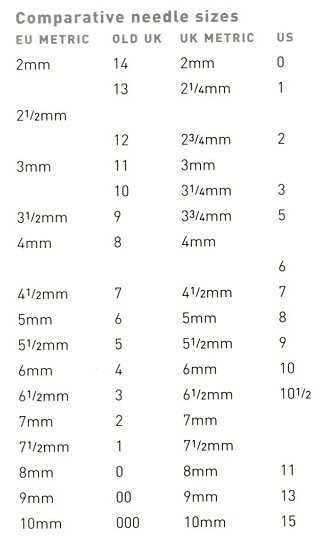 Generally, most garments require an average-size needle. The edges on a garment are often knitted in a rib stitch on a size smaller needle than the main body, as this gives the ribbing extra elasticity.If you are knitting seamless garments. you will need to use four needles. rather than two. Garments with more stitches than usual may require a special circular needle Sets of four double-pointed needles are used for tubular knitting and come in the full range of sizes. 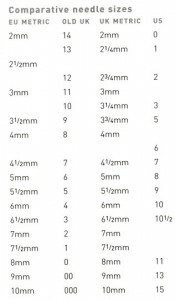 Right are a sample of mid-range needle sizes and a circular needle. used when a large number of stitches are required – for example, for a scarf knitted lengthways.